Periodontal tissues are the tissues that surround the teeth which support them and preserve their position. Periodontal tissues are composed of the gums, the bone around the teeth and the ligaments holding the teeth to the bone. The Plaque is the main cause of destruction to these tissues. Plaque affects the tissues directly, by the toxic materials secreted by bacteria inside the plaque, or indirectly, by stimulating the body to secrete destructive materials. 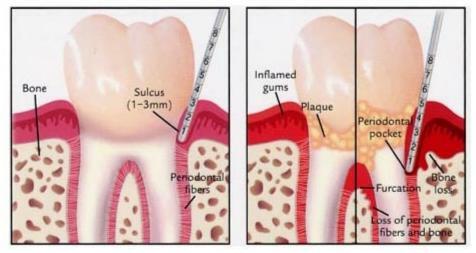 Beginning of inflammation can be seen as redness and minor swelling of the gum. This inflammation, if not treated, can cause mobility and looseness of the teeth. It is a must that you evaluate the condition of your gums frequently with a dentist. This will help in early interference if needed and remember the earlier the interference the better the prognosis. You are always welcome to "H.H. Clinic" for an early evaluation of your oral health where you will be treated by dentists who really care.